It's been a year and a half since I attended the Google Teacher Academy and became a Google Certified Teacher, and in that time I've incorporated lots of what I learned into my English classroom. My students and I use Chrome and Google Docs nearly every day, and have enjoyed exploring Google Hangouts, YouTube, and Chrome apps and extensions as often as we can. Google Forms, however, always felt like a tool meant for someone else. Though we certainly use forms at school (to take polls, register for clubs, provide feedback, etc.) I had trouble thinking of the role forms might play in my English classes, and so left them to the Math and Science teachers of the world. All that changed when Megan Rose Ellis, a fellow Google Certified Teacher, tweeted about her English students' independent reading achievements. Inspired by Megan and her awesome idea to have students fill out a form to log their independent reading, I started thinking about how forms might work for me and my 5th Graders. 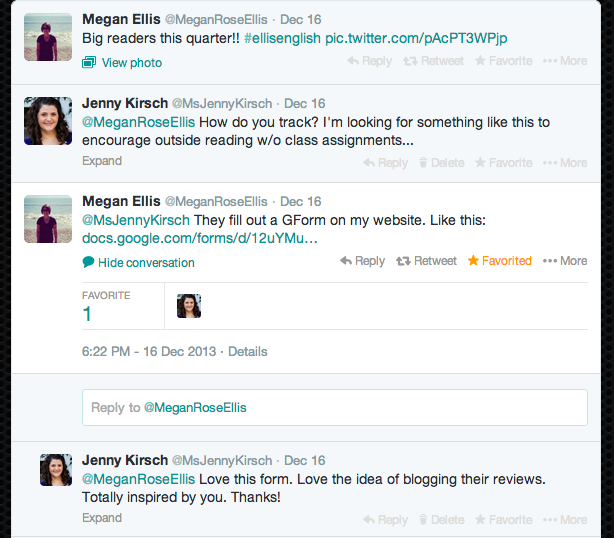 The above Twitter conversation is from December 2013, and roughly three months (and many email/Twitter troubleshooting sessions with Megan!) later, I find myself using forms with my students in ways I had never considered. 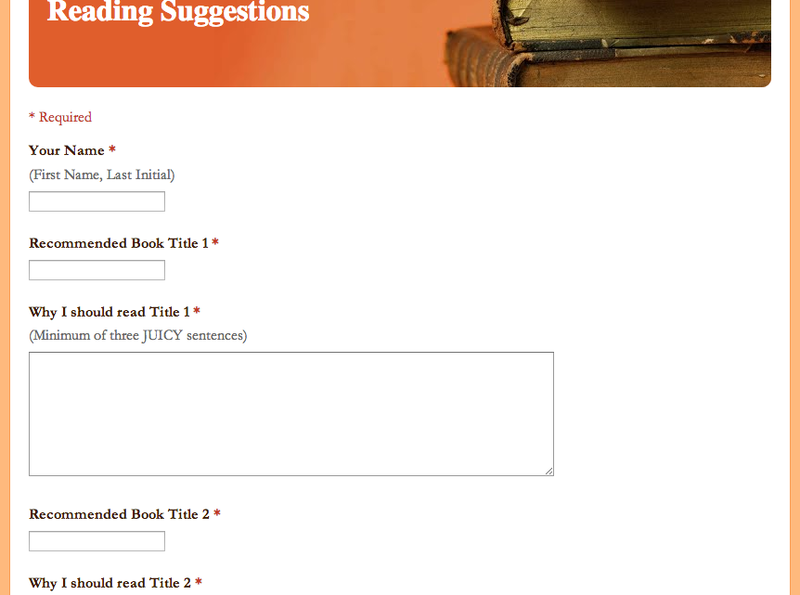 My first experiment was a Reading Recommendation Form. I'm always thinking about how to motivate my more reluctant readers to read independently, and I thought a chance to suggest a title for our classroom library might be a fun way to get everyone bragging about and sharing their favorite books. My students loved being able to submit their personal recommendations, and we all loved that they could do so paperlessly. Their responses were fantastic, and because Google Forms automatically imports all results into a spreadsheet, I was able to sort the data to a) confirm that all my students had completed the assignment and b) to organize the vocabulary words by chapters. 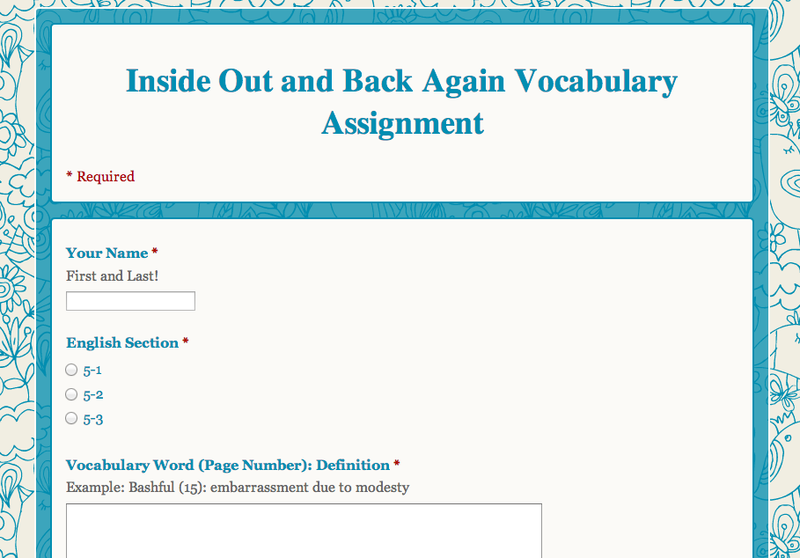 For our next novel, I plan to try the vocabulary assignment again, but rather than assigning them individual chapters, each student will submit the form once a week. 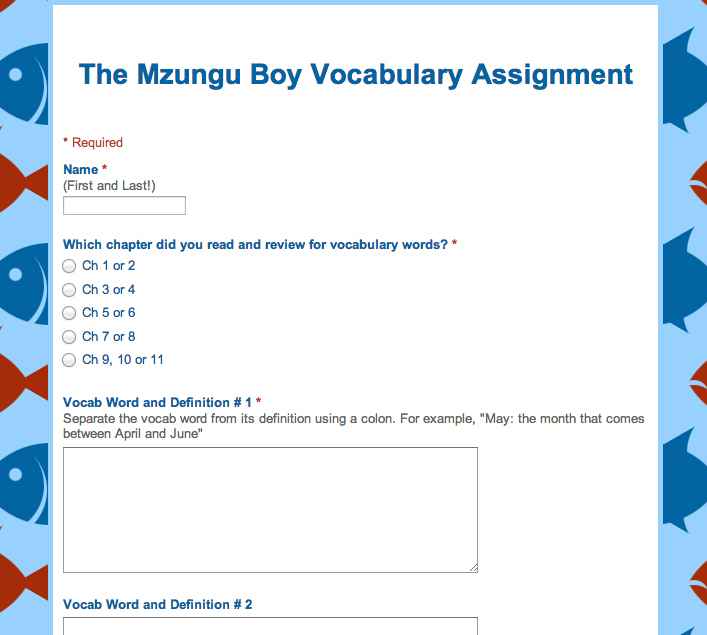 My plan is to assign the form every Monday, and ask the students to collect five juicy or interesting vocabulary words from that week's reading to define and submit for homework. I'm not sure if this weekly form will be superior to the individual chapter assignments, but I'm hopeful it will. In general, I'm finding forms to be a great tool for my classes. They're easy for students to use and low-impact for teachers, as submissions are automatically organized and stored in my Drive. I can make a form using any combination of multiple choice, short answer, long answer, check box, or list questions. The main challenge I've come across so far is that the form spreadsheet (which is automatically generated when I create a form) grabs hold of every question I put on the form, even those I think better of and edit and/or remove. This means that the response spreadsheet includes columns for questions I've deleted from the form itself, questions which students who fill out the form will never see. An annoying flaw for sure, but not one that's insurmountable. More than anything, this little glitch has quickly forced me to be much more thoughtful and careful in planning out my forms, which overall is not a bad outcome. I am experimenting with the logic branching options in Google forms. It's been a lot of fun and good for my brain. These are good ideas! I am an English teacher in Brussels and one way that I have used forms effectively is for parent conferences. I create a form that asks students to copy/paste their semester goals, reflection and a link to a piece of work they are proud of and would like to discuss in the conference. Once the data is in the spreadsheet, I assign each student a number based on the order of the conferences, sort the data and then during conferences I have a handy reference point so that conferences run smoothly. I must add that at my school we dedicate two days to conferences twice a year, with 10 minute sessions. When you do 80 of these your brain starts to slow down, so having the info easily available is very helpful.